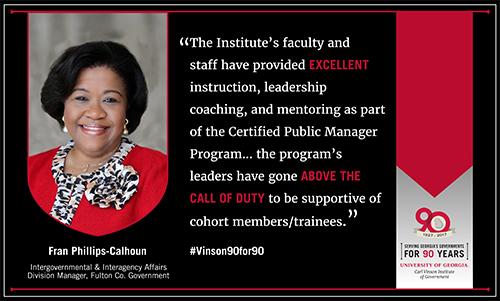 The University of Georgia's Certified Public Manager® (CPM®) program is an accredited member of the National CPM® Consortium and is designed to improve the quality and efficiency of government agencies by developing the effectiveness and professionalism of managers. These cohorts are open to state and local participants. This is an intensive multi-part program where you will learn about yourself, your organization and how to lead and manage more effectively. Individuals completing the 300-hour program receive a Public Manager Certificate from the University of Georgia. As a certification program, the requirements include active participation in each class, completion of out-of-class assignments and projects, and full attendance. Self-Awareness: How does knowing one's self influence leadership and management in the public sector? Collaboration: How does collaboration enhance leadership and management in the public sector? Process Improvement: How does improving processes and performance measures influence leadership and management in the public sector? The Certified Public Manager® (CPM®) program is designed to offer participants 300 hours of engaging study. Seven segments make up the required 300 hours of study. The Certified Public Manager® program is invaluable for developing and retaining your government managers to better serve your community. Provide your team with the tools needed to deliver quality services and improve the lives of your citizens with the CPM® Program. In addition to Continuing Education Units earned for CPM®, graduate credit is also available through UGA's Master of Public Administration program. View detailed program and course information.